The Jagannath Temple in Puri is a famous Hindu temple dedicated to Puri (Vishnu) and located in the coastal town of Puri in the state of Orissa, India. The name Puri (Lord of the Universe) is a combination of the Sanskrit words Jagat (Universe) and Nath (Lord of).The temple is an important pilgrimage destination for many Hindu traditions, particularly worshippers of Krishna and Vishnu, and part of the Char Dham pilgrimages that a Hindu is expected to make in one's lifetime . The temple was built in the 11th century atop its ruins by the progenitor of the Eastern Ganga dynasty, King Anantavarman Chodaganga Deva. The temple is famous for its annual Rath Yatra, or chariot festival, in which the three main temple deities are hauled on huge and elaborately decorated temple cars. Since medieval times, it is also associated with intense religious fervour. Legendary account as found in the Skanda-Purana, Brahma Purana and other Puranas and later Oriya works state that Lord Puri was originally worshipped as Lord Neela Madhav by a Savar king ( tribal chief ) named Viswavasu. Having heard about the deity, King Indradyumna sent a Brahmin priest, Vidyapati to locate the deity, who was worshipped secretly in a dense forest by Viswavasu. Vidyapati tried his best but could not locate the place. But at last he managed to marry Viswavasu's daughter Lalita . At repeated request of Vidyapti, Viswavasu took his son-in-law blind folded to a cave where Lord Neela Madhav was worshipped. from the Ganga dynasty, the construction of the current Puri temple was initiated by the ruler of Kalinga, Anantavarman Chodaganga Dev.The Jagamohana and the Vimana portions of the temple were built during his reign (1078 - 1148 CE). However, it was only in the year 1174 CE that the Oriya ruler Ananga Bhima Deva rebuilt the temple to give a shape in which it stands today. The Nila Chakra (Blue Discus) is the discus mounted on the top shikhar of the Puri Temple at Puri. As per custom, everyday a different flag is waved on the Nila Chakra. The flag hoisted on the Nila Cakra is called the Patita Pavana (Purifier of the Fallen) and is equivalent to the image of the deities placed in the sanctum sanctorum, The Nila Chakra is a disc with eight Navagunjaras carved on the outer circumference, with all facing towards the flagpost above. The Nila Chakra on Puri Temple is made of alloy of eight metals (Asta-dhatu) and is 3.5 Metres (11 feet and 8 inches) high with a circumference of about 11 metres (36 feet). The Nila Chakra is distinct from the Sudarshana chakra which has been placed with the deities in the inner sanctorum. Nila Chakra is the most revered iconic symbol in the Puri cult. The Nila Chakra is the only physical object whose markings are used as sacrament and considered sacred in Puri worship. 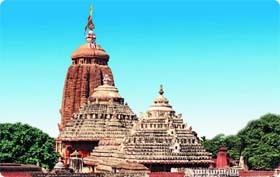 It symbolizes protection by Shri Puri. There are numerous smaller temples and shrines within the Temple complex where active worship is regularly conducted. The temple of Mahalakshmi has an important role in rituals of the main temple.It is said that preparation of naivedya as offering for Puri is supervised by Goddess Mahalakshmi. The Kanchi Ganesh Temple is dedicated to Uchhista Ganapati. Tradition says the King of Kanchipuram in ancient times gifted the idol,when Gajapati Purushottama Deva married Padmavati,the kanchi princess.There are other shrines namely Muktimandap, Surya, Vimala, Saraswati, Bhuvaneshwari, Nrsimha, Ramachandra, Hanuman and Eshaneshwara.